Omega-3 fatty acids reduce F. nucleatum–induced fetal and neonatal death, placental inflammation, and bacterial proliferation. Inbred C57BL/6 mice and outbred CF-1 mice were gavaged with fish oil, water, or nothing throughout the gestation starting day 1 through day 16 or 17, when approximately 107 CFU of F. nucleatum 12230 or saline was injected via tail vein. (A and C) Fetal and neonatal death rates of C57BL/6 (A) and CF-1 mice (C). Death rates are expressed as the percentage of dead fetus and neonates of each litter at birth and followed through 3 days after birth. Each geometric symbol represents 1 pregnant mouse. Treatment is listed below the x axis. The horizontal lines indicate the average death rates, and error bars represent SEM. 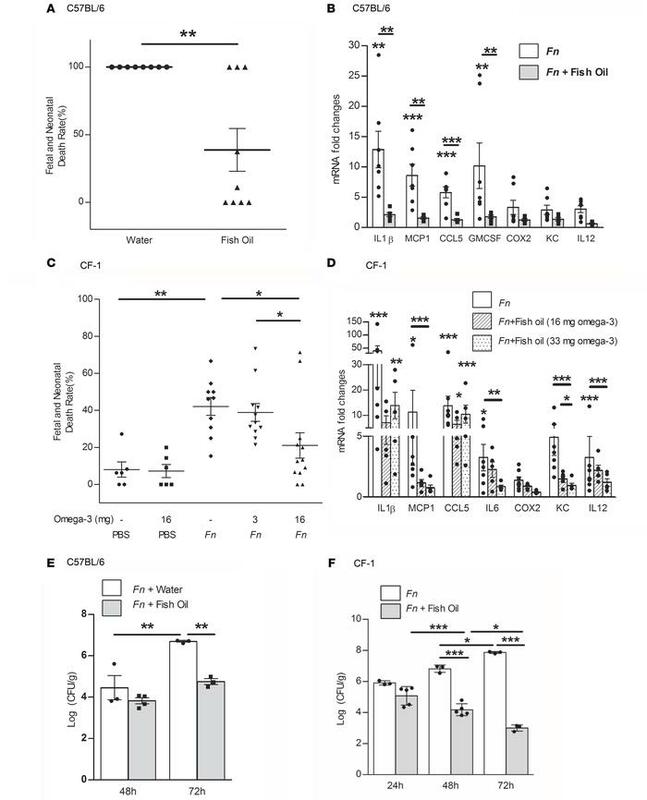 (B and D) Placental inflammatory mRNA gene expression levels in C57BL/6 (B) or CF-1 mice (D) at 48 hours after injection. Gene expression is presented as fold change in comparison to the saline-injected controls, with average and SEM. At least 5 pregnant mice were included in each group. (E and F) Live F. nucleatum titers in the placentas of C57BL/6 (E) or CF-1 mice (F) at 48 and 72 hours (E) or 24, 48, and 72 hours (F) after injection are expressed as log(CFU per gram tissue). At least 3 pregnant mice were included in each group. The results are presented as dot plots, with average and SEM. Mann-Whitney test (A) or 2-way ANOVA (B–F) was performed with simple-effects analysis when the interaction was significant. Student-Newman-Keuls was applied for post-hoc comparisons. *P < 0.05, **P < 0.01, ***P < 0.001.